Sodalite: The rare blue mineral used as a gem. The blue gem material, ornamental and architectural stone. Sodalite: Pieces of polished sodalite. Image by Adam Ognisty, used here under a GNU Free Documentation License. Click to enlarge. Sodalite is a rare rock-forming mineral best known for its blue to blue-violet color. It has a chemical composition of Na4Al3Si3O12Cl and is a member of the feldspathoid mineral group. High-quality sodalite is used as a gemstone, a sculptural material, and an architectural stone. Sodalite occurs in igneous rocks that crystallized from sodium-rich magmas. This is the origin of the name "sodalite." These magmas also contained so little silicon and aluminum that quartz and feldspar minerals are often absent. Sodalite-bearing rocks include: nepheline syenite, trachyte, and phonolite. These types of rocks are so rare that most geologists never see them in the field. 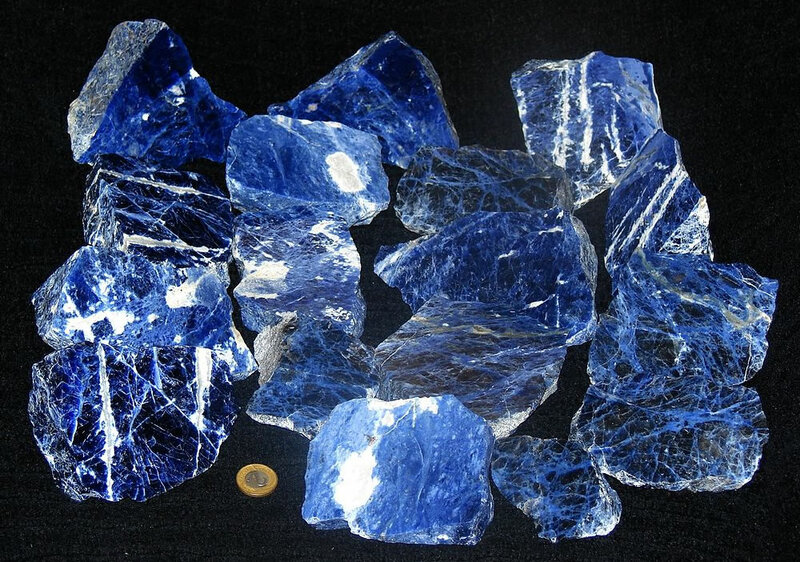 Well-known sources of sodalite include: Litchfield, Maine; Magnet Cove, Arkansas; northern Namibia; Golden, British Columbia; Bancroft, Ontario; Kola Peninsula of Russia; and the Ilimaussaq intrusive complex of Greenland. Nepheline syenite with sodalite: Nepheline syenite rich in light blue sodalite. This rare material is sold as a dimension stone for interior use under the trade name of "sodalite granite." Found near Ice River, British Columbia, Canada. Specimen is approximately 3 inches (7.6 centimeters) across. Sodalite is a member of a mineral group known as "feldspathoids." 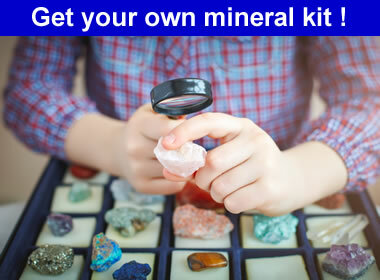 They are rare aluminosilicate minerals that contain abundant calcium, potassium, or sodium. Examples are sodalite, nepheline, leucite, nosean, hauyne, lazurite, cancrinite, and melilite. These minerals often occur in igneous rocks, the veins and fractures that cut them. They also occur in contact metamorphic rocks. Sodalite granite: A close-up of the "sodalite granite" from Ice River, British Columbia, Canada. Sodalite is usually blue to blue-violet in color and found with nepheline and other feldspathoid minerals. It is usually translucent, with a vitreous luster, and has a Mohs hardness of 5.5 to 6. Sodalite often has white veining, and it can be confused with lapis lazuli. Small amounts of sodalite are present in many specimens of lapis lazuli. If significant pyrite is present, the specimen is not sodalite. Sodalite is a member of the cubic crystal system, but well-formed crystals are rarely found. It is usually massive in habit and breaks with a conchoidal fracture rather than exhibiting its poor cleavage. Color Often bright blue to violet-blue with white veining. Also gray, white, green, colorless, yellow, red. Cleavage Poor cleavage in six directions that is usually unnoticed. Breaks by conchoidal fracture. Diagnostic Properties Blue color, associated with feldspathoid minerals, especially nepheline. Differentiated from lapis by its darker blue color and an absence of pyrite. Often produces a weak orange fluorescence under shortwave or longwave ultraviolet light. Uses A semiprecious gemstone often used to produce cabochons, beads, and tumbled stones. An ornamental stone often used to make small sculptures. "Sodalite granite" is a rare nepheline syenite with minor to abundant sodalite that is cut as a dimension stone for interior use. A less costly alternative to lapis lazuli. Sodalite tumbled stones: Tumbled stones of sodalite. Pieces shown are about 5/8" to 1" in diameter. Blue is a rare color for rocks and minerals. When was the last time you found a rock with a vivid blue color? Have you ever found one in nature? When a blue rock - especially one capable of serving as a gem material - is found it immediately has a market. Sodalite is one of the only vivid blue materials that is still sold at a reasonable price. But, sodalite can be hard to find in finished jewelry. It is rarely seen in mall jewelry stores, and it is seen less often in high-profile jewelry stores. Most jewelry customers are not familiar with sodalite, and very few of them are asking for it in stores. Stores stock what customers want to buy. The place to find sodalite in jewelry is at craft and lapidary stores and shows. Part of the reason that sodalite is not widely used in commercial jewelry is that cut cabochons vary so much in appearance that it is difficult to impossible to produce a standardized product line. Sodalite is sometimes confused with lapis lazuli. Some specimens have a similar color and the presense of white veining is found in both materials. This gives sodalite the opportunity to be used as a less expensive alternative gem for people who like lapis lazuli but don't want to pay the high price. However, sodalite cabochons, beads and tumbled stones are beautiful and many people enjoy them. They are available at prices that fit almost anyone's budget. A limitation on sodalite's use in jewelry is its hardness of 5.5 to 6 on the Mohs scale. It will be quickly scratched if used in a ring or bracelet. It therefore is best used in earrings, pins, pendants, and other items that will not subject the sodalite to impact or abrasion.